Paul Dukas based his only opera on Maurice Maeterlinck's symbolist version of a classic tale. Claus Guth's production updates the action to the present day, placing it in a brightly lit and sanitised modern villa, consciously at odds with the horror of the wives' incarceration in a concealed basement below. 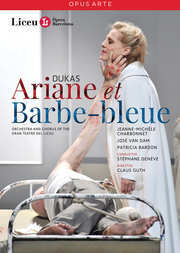 José van Dam is cast as the villainous Barbe-Bleu, while taking on the immensely demanding role of Ariane - who does not leave the stage throughout the entire opera - is American soprano Jeanne-Michèle Charbonnet.